Author/Opus: This is the 234th puzzle from our contributing puzzlemaster Serkan Yürekli. Rules: (Hybrid of Fillomino and Snake Puzzles.) Divide the grid along the boundary lines so that every cell belongs to a snake. A snake is a one-cell-wide path at least two cells long that does not touch itself, not even diagonally. Circled cells must be at one of the ends of a snake. A snake may contain one circled cell, two circled cells, or no circled cells at all. Numbered cells must be part of a snake with a length of exactly that number of cells. A snake may contain one number, multiple identical numbers, or no numbers at all. Two snakes of the same length cannot touch each other horizontally or vertically. Answer String: For each cell in the marked rows/columns, enter the length of the snake it belongs to. Enter just the last digit for any two-digit number. This example has the key “35522,44462”. Note: Follow this link for more Snake Pit puzzles. Follow these links for other Fillomino or Snake puzzles. 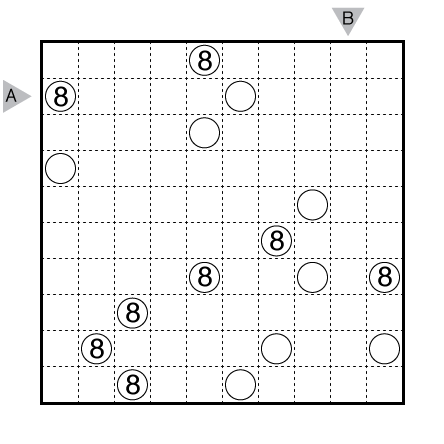 Author/Opus: This is the 189th puzzle from our contributing puzzlemaster Serkan Yürekli. 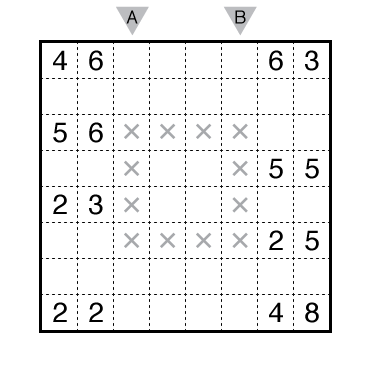 Author/Opus: This is the 6th puzzle from guest contributor Joseph Howard. Rules: Variation on Snake Pit (new rules in italics). Divide the grid along the boundary lines so that every cell belongs to a snake. A snake is a one-cell-wide path at least two cells long that does not touch itself, not even diagonally. Circled cells must be at one of the ends of a snake. A snake may contain one circled cell, two circled cells, or no circled cells at all. 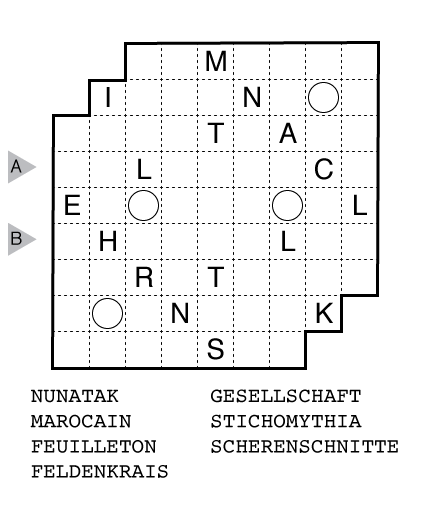 Each snake houses a word (given below the grid) with one letter in each cell. Some letters are given. Snakes of the same length cannot touch each other horizontally or vertically. Answer String: Enter the letter placed in each cell in the marked rows from left to right, separating the two rows by a comma. Use CAPITAL LETTERS! Note: Follow this link for other Snake puzzles. 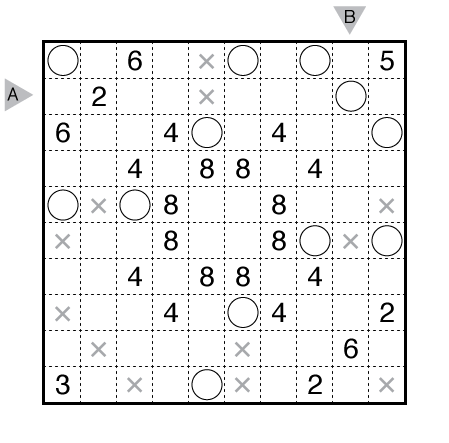 Author/Opus: This is the 1st puzzle from guest contributor Ken Endo. 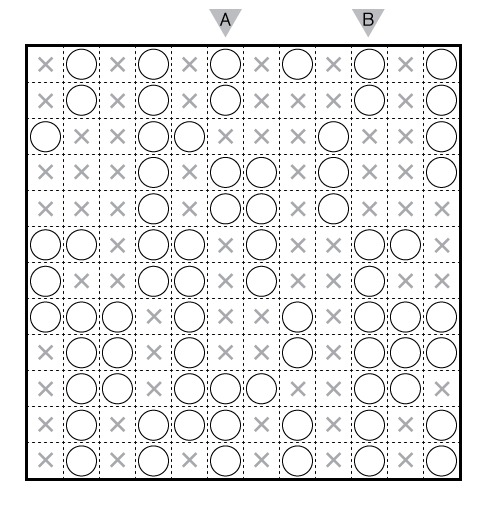 Rules: Divide the grid along the boundary lines so that every cell belongs to a snake. A snake is a one-cell-wide path at least two cells long that does not touch itself, not even diagonally. Circled cells must be at one of the ends of a snake. A snake may contain one circled cell, two circled cells, or no circled cells at all. Numbered cells must be part of a snake with a length of exactly that number of cells. A snake may contain one number, multiple identical numbers, or no numbers at all. Two snakes of the same length cannot touch each other horizontally or vertically. Cells with an X cannot be an end of a snake. Answer String: For each cell in the marked rows/columns, enter the length of the snake it belongs to. Enter just the last digit for any two-digit number. This example has the key “33553,44664”. 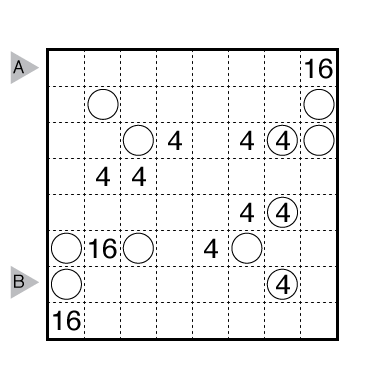 Author/Opus: This is the 1st puzzle from guest contributor Shinichi Aoki. 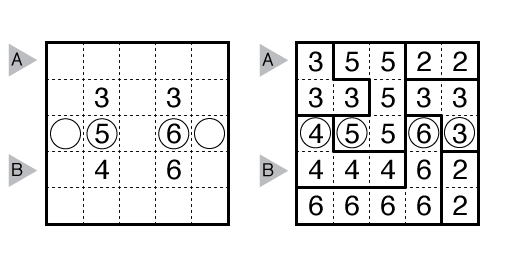 Author/Opus: This is the 2nd puzzle from guest contributor Takeya Saikachi. 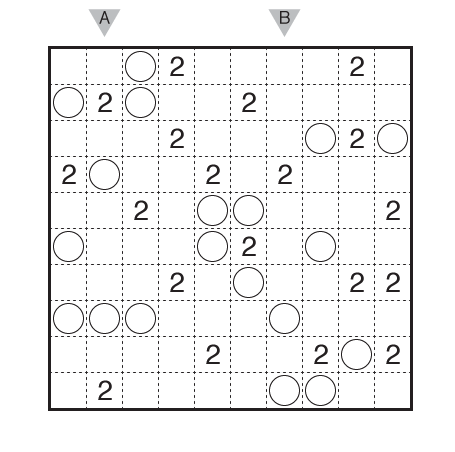 Author/Opus: This is the 4th puzzle from guest contributor Nikolai Beluhov. Answer String: For each cell in the marked columns, enter the length of the snake it belongs to. Enter just the last digit for any two-digit number. This example has the key “33553,44664”.